No matter your ability level, a comfortable boot is an absolute necessity. Nothing ruins a good powder day faster than cold or painful feet, and ill-fitting boots also run the risk of not properly transferring energy to your skis and thereby harming your performance. Amid this doom and gloom, however, is the welcome news that ski boots have never been more foot-friendly than they are today. Most new boots have customizable liners and some even come with heat-customizable shells. 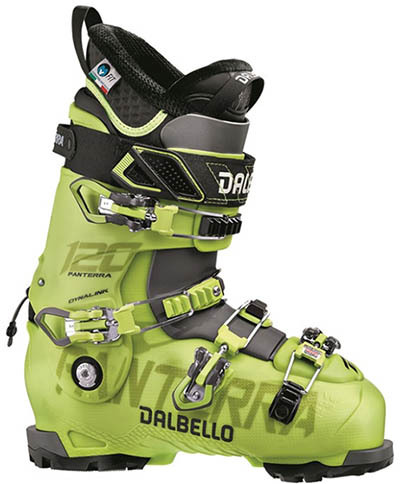 Below are our picks for the best downhill ski boots of 2018-2019. For more information, see our comparison table and buying advice below the picks. To complete your alpine kit, check out our articles on the best all-mountain skis and ski bindings. What we like: Successful all-mountain adaptation of a downhill racing boot. What we don’t: Steep price tag. 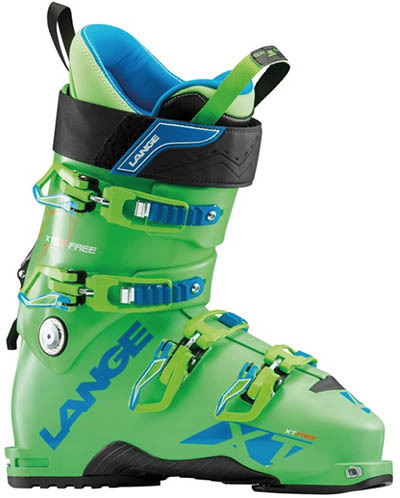 For advanced skiers looking for the ultimate in performance and comfort, we like the stellar RX 120 from Lange. Inspired by their race-bred RS boots, which is evident in the powerful stance, burly 4 buckles, and substantial power strap, the Lange is a stiff, aggressive boot that responds precisely to small inputs. It will make demanding skiers quite happy, from former racers to serious up-and-comers and just about everyone in between. The RX adds all-mountain flair to its downhill performance with swappable soles for hiking, although we'd prefer to see a walk/hike mode for sidecountry exploring. But if you can afford the $600 price tag, it’s the real deal. 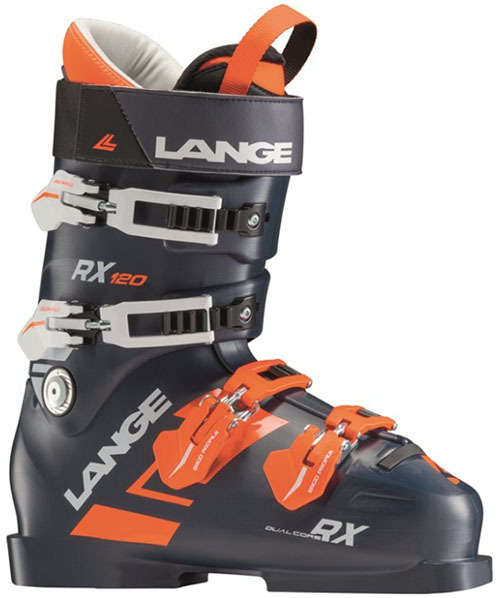 For heavier skiers and those that really like to rip it, the Lange RX is available in a 130 flex and a 130 Low Volume version with a 97mm width. And you can step down in stiffness to the Lange RX 100 as well. What we like: Top-end fit customization and comfort. What we don’t: Only powerful skiers will truly enjoy it. 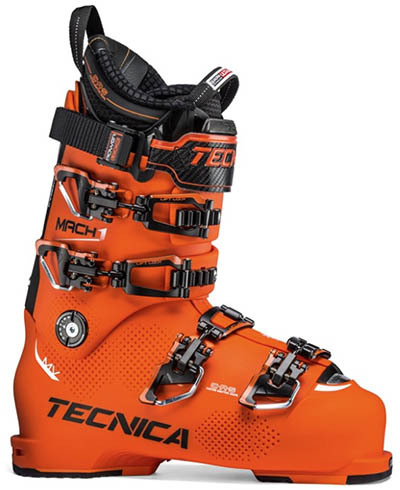 A lot of brands tout fit customization as a key feature of their boots, but few go as far as Tecnica. Their Mach1 boots are a great case in point. Built to match the anatomical shape of your foot as well as anything else on the market, you get a highly customizable liner and shell that can be punched, grinded, and all-around manipulated by a bootfitter. The alpine performance of the Mach1 is no slouch either, with a natural stance and excellent power transfer in either the 130 or 120 stiffness models that can give the Lange RX a run for its money. Overall, both the Tecnica and Lange are fantastic all-around builds, and a decision between the two should come down to fit. Thanks to a greater market emphasis on medium and high-volume boots, the Mach1 130 is offered in a low volume (98mm), medium (100mm), or new high-volume last (103mm). What we like: Proven mix of price and performance. What we don’t: Those that require maximum stiffness should look elsewhere. Salomon's X Pro has a downhill focus and features everything we want in a mid-range model: plush liner, solid support, and smooth forward flex. Advanced or powerful downhillers may want to look into the upgraded 120 or 130 flex versions, but we think the X Pro 100 and women's X Pro 90 are great choices for advancing intermediate skiers that spend more of their time carving the groomers. It's little surprise this is one of the most popular designs on the market. Heat-moldable shells are one of the top recent innovations in the boot world, and Salomon makes some of the best. It delivers 90% of the fit and comfort that used to require a big money bootfitter, and all that’s needed is a ski shop with an oven. 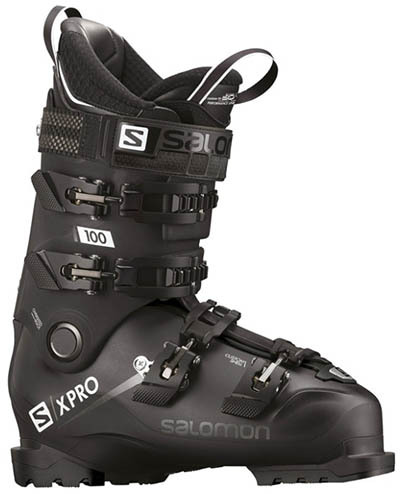 Salomon's version is referred to as a 360-degree custom design, and the X Pro can be manipulated in all directions around the foot. It all adds up to a boot that fits a lot of foot types very well. What we like: Supremely supportive with an adaptable liner. What we don’t: Fit technology isn’t a universal fix for narrow feet. A great boot for skiers that cover all of the mountain, the Panterra is made with a slick 3-piece shell. The lower portion is super stiff for superior power transfer and a slightly more forgiving upper flexes smoothly when you tuck it and go. The upgraded I.D. liners are a real treat: comfortable, light, and resistant to packing out, they land in that ideal space of warmth and support. Should you not have the option or not want to spring for a bootfitter, the liner and shell are designed to give a custom fit without any of the after-the-purchase work. Contour 4 Technology means the low-volume performance liner is given a little extra breathing space between liner and shell around the toes, and heel and bend in the foot and ankle. Further, the buckle across the toes allows you to adjust the last width between 100mm and 102mm. The result for most folks with normal sized feet is a snug fit that doesn’t pinch at the usual pain points. And at $550, it undercuts some of the 120-flex competition quite nicely. See the Men's Dalbello Panterra 120 I.D. See the Women's Dalbello Kyra 95 I.D. 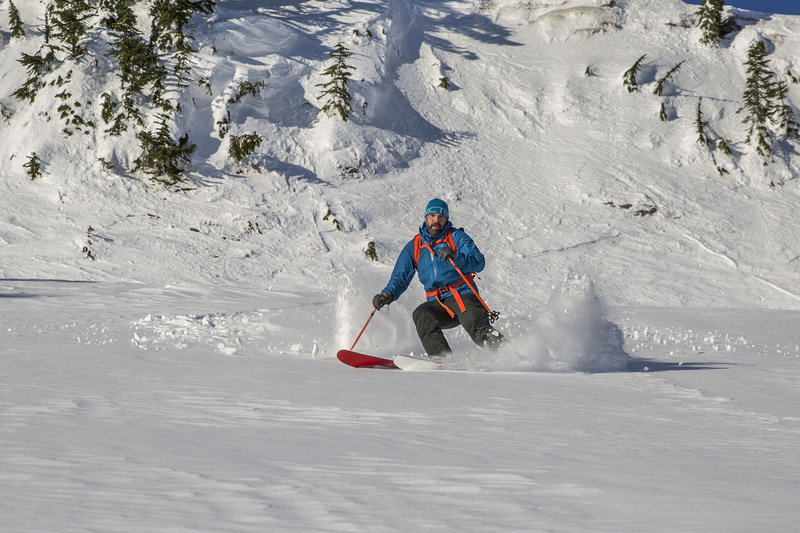 What we like: A great crossover option for resort and backcountry use. What we don’t: Expensive (although cheaper than buying two pairs of boots). 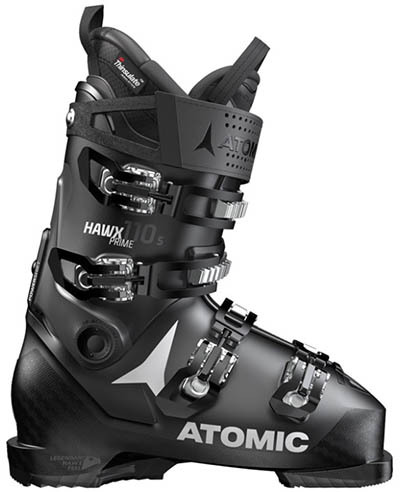 A quick glance at the Atomic Hawx Ultra XTD reveals that this is no ordinary downhill boot. The slim shape, large walk/ride lever, and tech binding-compatible inserts at the toe are built for backcountry adventure. But what earns the Atomic a spot on this list is its versatile nature—if you split your time between touring and the resort, this is one of the best options yet. The Hawx is very lightweight and flexes freely while hiking but is planted and impressively solid for railing a groomer. As with any product that aims to balance conflicting priorities—in this case it’s weight and stiffness—there are some downsides. Race-oriented downhillers likely will want a sturdier ride, and while the boot is very light and offers competitive range of motion, we’d still take a boot like the Scarpa Maestrale RS for touring exclusively. But if you’re investing in a single boot to do it all, the Hawx Ultra XTD deserves a serious look. What we like: Excellent fit customization, comfort, and value. What we don’t: Not a high-performance piece. 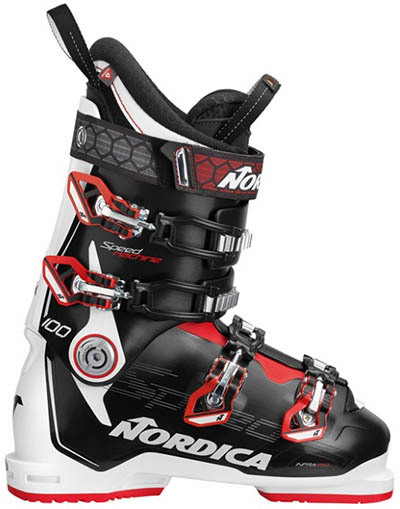 Nordica boots are known for comfort, and the Speedmachine 100 is no exception. This all-mountain boot has a wallet-friendly price of $400, but includes a cushy, warm liner filled with PrimaLoft insulation and offering fantastic fit customization. Using their proprietary infared lamp and suction cup system, the liner, shell, and even some of the hardware pieces can be molded by a Nordica boot fitter. 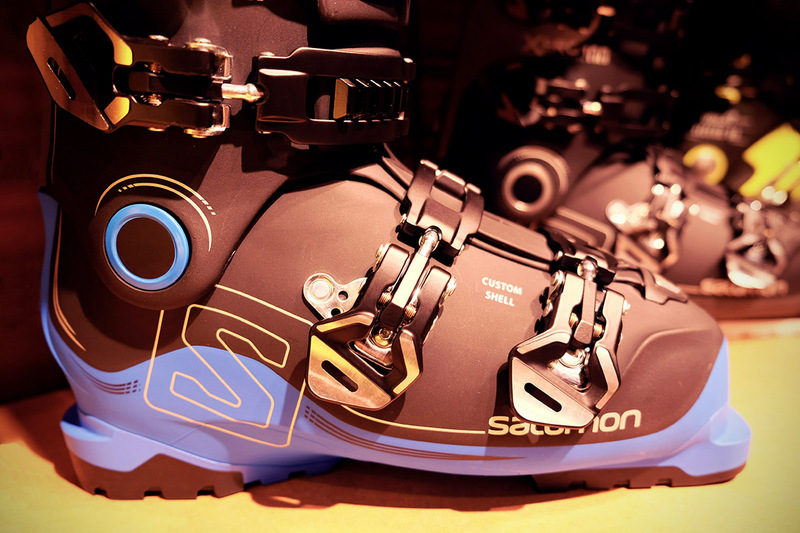 And with four sturdy buckles and a smooth flex, the Speedmachine 100 makes a great option for lightweight or intermediate skiers. The Speedmachine’s affordable price does have a mild impact on performance. Within the 100-flex category, the mid-range Nordica is a fine alternative to the Salomon X Pro above, although skiers who get out a lot may appreciate the Salomon’s upgraded, long-lasting liner. But comfort shouldn’t be an issue with the Speemachine, and we really like that Nordica has recognized that a highly customizable shell has real appeal even for casual skiers. What we like: Lightweight and a great value. What we don’t: Unproven long-term durability. K2’s Recon technically replaces the outgoing Sypne for 2018-2019, but it’s a whole different animal. This new all-mountain boot has been designed from the ground up to trim weight wherever possible. The result is impressive: the Recon weighs more than one pound less per boot than the top-rated Lange RX 120 above. It’s true that an ultralight design isn’t as important for downhill use as in the backcountry, but the Recon has a very nimble feel on the slopes that’s relatively easy to control. And at a true 120 flex, it’s still plenty strong for most skiers when powering through high-speed turns. Priced at $500, the Recon 120 undercuts most of its direct competition by $100 or more (the 130-flex version is equally competitive at $600). From a performance standpoint, you don’t give up a lot—expert-level skiers likely will want to stick with the Lange for its premium feel, but most should find little to complain about. The main question mark is long-term durability, and given the extent of the weight trimming, it’s safe to assume it won’t be a standout in the area. But the Recon nails the fun factor, and its excellent price and low weight make it an intriguing resort option. What we like: Race-level feel and adjustable flex. What we don’t: Snug fit is best for narrow feet and serious riders. The 120 and 130 flex boots above should do the trick for most aggressive riders, but super strong skiers or those with a racing background may be left wanting more. If this sounds like you, the Head Raptor 140 RS deserves a serious look. This boot packs an extremely rigid 140 flex, top-tier power transfer and feel, and a very snug fit. In addition, its liner is just thick enough to offer decent protection and comfort while not compromising performance, and the buckles, power strap, and shell all have a quality feel. 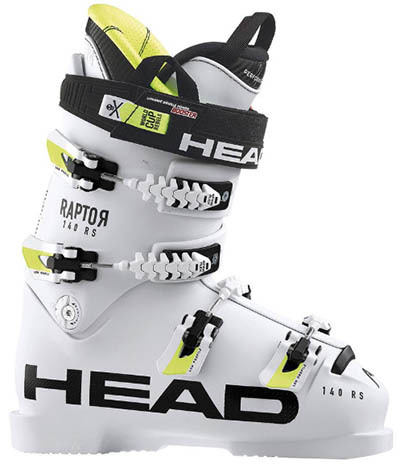 All told, the Raptor 140 RS is a fantastic boot for hard-charging, on-piste skiers. While the steep price and sky-high flex push the Raptor into the racing category, it’s a surprisingly versatile design. With a few simple adjustments, the boot can be run at either 120 or 130 flex, giving it a more forgiving character. It’s still not as comfortable when exploring the sidecountry or the bumps as the all-mountain designs above, but the softer flex option is a nice feature. Head also makes the Raptor RS in 90 and 120 flex versions, although the 140 model takes full advantage of the boot’s potential. What we like: Great range of motion. What we don’t: A little soft and flexy for a hard charger. Prized by bootfitters for being both comfortable and customizable, the Tecnica Cochise is a great value at $500. A medium-stiff boot with a flex rating of 100, it’s designed for skiers that want a comfortable downhill design that can do short-term work in the backcountry. The Cochise has a smooth-operating walk/tour mode with good range of motion, and the higher flex 130 model comes with tech binding inserts. A couple years ago, Tecnica tweaked the Cochise's design, bringing the last in 1mm (from 100mm) and upgrading the hike mode for even easier operation. It can't match a true downhill boot in terms of precision and power, but the Cochise should make most intermediate riders happy. Overall, the 100 flex version is light, fun, and versatile. What we like: Awesome Fischer downhill performance. What we don’t: Premium Fischer price. 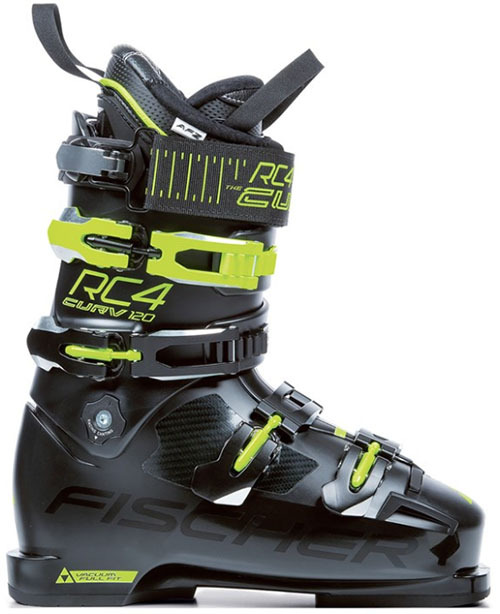 Fischer’s RC4 Curv 120 shares its name with the brand’s hyper aggressive downhill ski, so its high-speed intentions are very clear. This boot is all about pro-level power and control: it’s made with a very solid shell, strong 120 flex (a 140-flex design is available), and narrow 97-millimeter last. But comfort hasn’t been forgotten, and the RC4 has an anatomical liner and is compatible with Fischer’s Vacuum Full Fit heat molding system. Skiers looking for a versatile all-mountain boot likely will prefer one of the options above over the RC4 Curv. The Fischer’s high performance ceiling makes it heavy and unforgiving on sidecountry hikes, and it requires a very capable pilot to truly enjoy the ride. Further, the $750 price tag is expensive considering its flex and on-trail focus. But the RC4 is a no-compromise design for those that intend to spend their season carving at full tilt. What we like: A nice hybrid boot for downhill and hiking. What we don’t: Walk mode doesn’t flex as much as we would like. 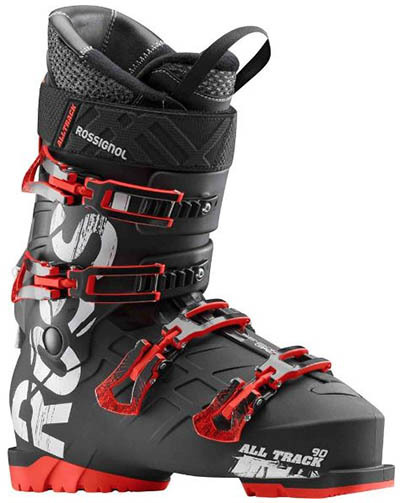 Rossignol’s Alltrack line of boots is extensive and popular among skiers for doing just about everything well. We’ve picked the Alltrack 90 here, which is a nice option for intermediate skiers who stick mostly in bounds but may venture to other parts of the mountain on occasion. Rossignol plays up the walk mode function, which performs decently well but still falls behind the competition in terms of flex on the uphills. But at the $350 price point, the Alltrack 90 is a solid boot for lighter skiers and those who want to start with short bootpacks without taking the plunge on an expensive pair of specialty boots. And we like the comfort factor, which is cozy on the foot and lightly insulated for added warmth. For more flex options, the Alltrack series has two other models (110 and 120) and the narrower 100mm width Alltrack Pro line has four (100, 110, 120, and 130). What we like: Awesome freeride option. What we don’t: Dabello’s Panterra is the better all-mountain design. For a different sort of downhill beast, Dalbello’s Il Moro I.D. is built for aggressive freeriders that hunt out big jumps, drops, and features all over the hill. 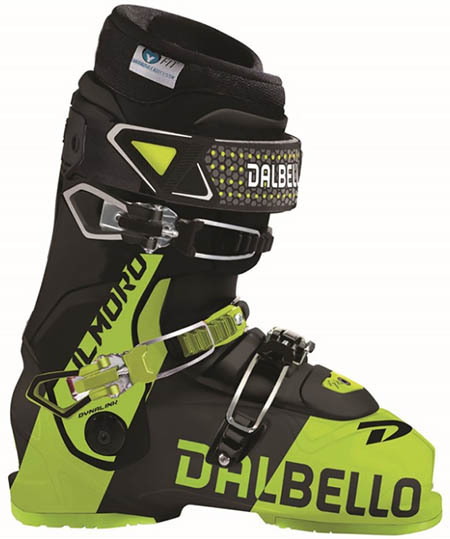 In contrast to the boots above, the Dalbello allows for extra lateral flex and even includes a “Landing Board” to help take the sting out of a hard impact. And despite the focus on off-piste adventuring, the Il Moro is plenty responsive, sharing the same 3-piece shell technology as the Dalbello Panterra above. Unlike the Panterra, however, the Il Moro isn’t a top choice for standard all-mountain use. The boot’s specialized construction and 3-buckle layout emphasizes shock absorption and isn’t as steady carving a hard or icy corner. But for the right skier—the Il Moro I.D. is a popular choice for pro freeriders—this is an awesome boot. See the Dalbello Il Moro I.D. What we like: Lighter than the previous model but still very comfortable. What we don’t: No hike mode to utilize the reduced weight. 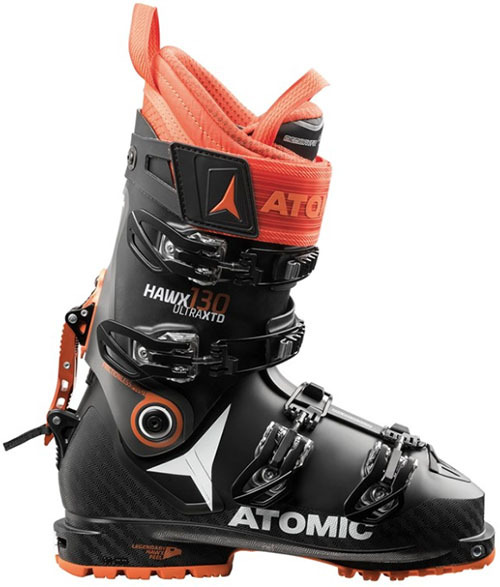 Over the past few years, the Atomic Hawx Prime has been a go-to choice for skiers with medium-width feet. For this season, they’ve retained that excellent fit but in a new ultralight design. Taking inspiration from their XTD touring model above, the new Prime has trimmed away about 15 ounces per boot (the number will vary a bit based on flex). Importantly, this didn’t involve compromising comfort: the memory foam liner, adjustable forward lean, and strong 4-buckle layout all are still here. As with the K2 Recon above, we’re not sold on the fact that cutting away a ton of weight from the downhill-oriented Hawx Prime is all that necessary. It’s something you’ll appreciate on a long bootpack, but the Prime doesn’t have a hike mode to really utilize the slimmed-down design. Also, the boot is not as good of a value as the Recon above, which offers very similar performance and quality at a $100 discount. But those that have liked the fit of the Atomic Hawx in the past and value the lighter feel should try the new Hawx Prime. What we like: Lange comfort and precision with touring capabilities. What we don’t: Inferior touring performance than the Atomic Hawx Ultra XTD above. The Lange XT Free takes the comfort and performance of the RX above and trims it down for touring use. It’s a great combination for downhill-minded backcountry skiers: the boot is strong enough to be considered a full 130 flex, so you’re not compromising in terms of performance. But flipping it into hike mode gets you surprising climbing capabilities. And the addition of tech inserts on the toe and a lightweight Grilamid shell for 2018-2019 have only increased XT Free 130’s appeal. 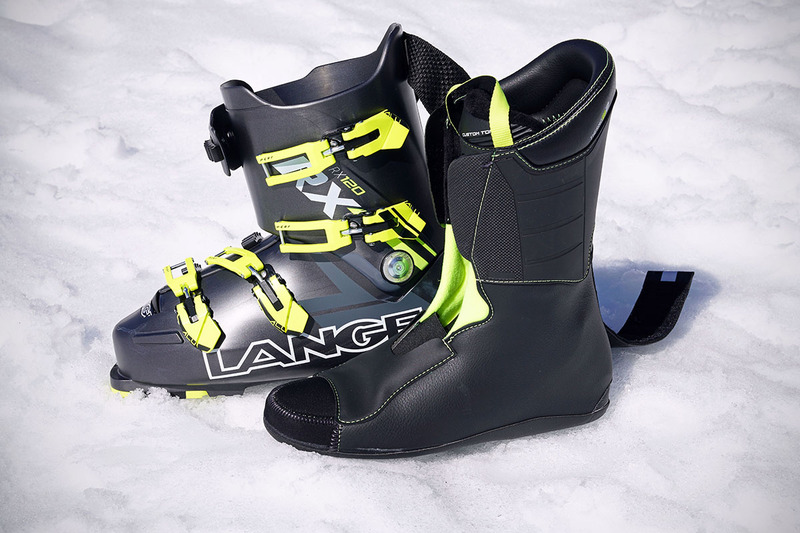 The Lange XT Free and Atomic Hawx Ultra XTD above are direct competitors in the growing segment of all-in-one downhill/backcountry boots. In comparing the two, the Lange is incredibly solid on the downhill, but weighs approximately 13 ounces more per boot and lacks the impressive range of motion and efficiency of the Atomic for touring. For the occasional foray or quick ascent, the Lange isn’t a big compromise, but those that spend a lot of time on the uphill will likely prefer the Atomic. If you need a wider last, however, the Lange is the better option with a 100mm-width model to compliment the low volume 97mm version (the Hawx Ultra XTD currently is only available in a 98mm last). What we like: The liner is made with a wool hybrid material for warmth. What we don’t: Not for narrow feet. The QST Access 90 is a solid beginner to intermediate boot from one of the most well respected brands in the business. One of our favorite features is the hike/ski switch on the back—when flipped to hike, the lower and upper cuff unlock to allow for normal upright walking, which is handy for schlepping gear from the parking lot or standing in the bar after a long day. The three-buckle design is simple to operate, and the liner is heat-moldable to customize fit before you head out. 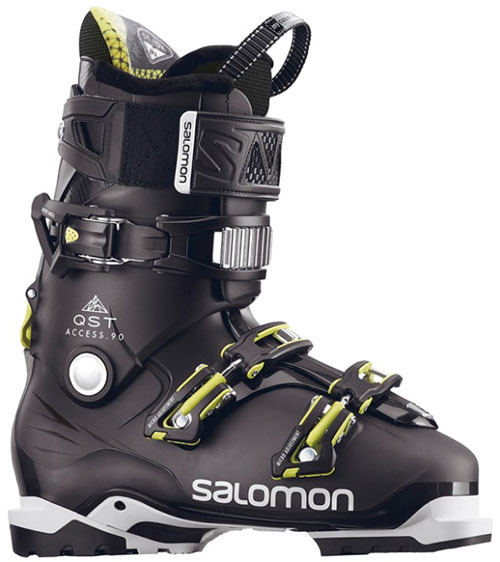 The 104mm last width is the widest in the Salomon lineup, and the QST Access 90 is designed to work best with an average calf volume. 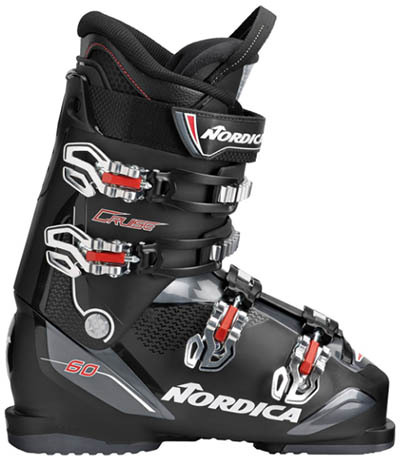 A step up in terms of stiffness and overall quality from the Nordica Cruise below, this boot should serve progressing beginner and intermediate resort goers quite well. More ambitious riders will probably want to check out Salomon's X Pro line above. What we like: Lightweight and versatile. What we don’t: Material quality could be better. Nothing is groundbreaking about the Full Tilt Classic, which is exactly why many people like it. 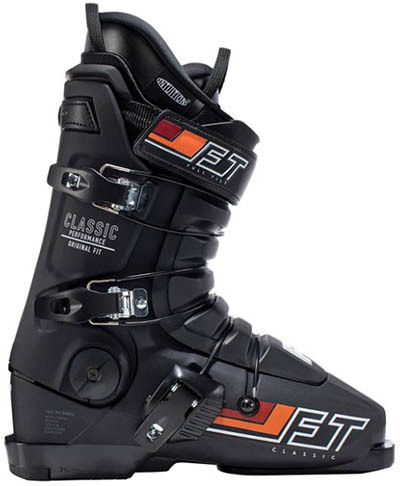 This is Full Tilt’s original 3-piece shell and last with new some recent upgrades to the liner, and it’s a nice all-around option for intermediate to advanced skiers with narrow feet. Full Tilt doesn’t use the same flex ratings as other manufacturers, but the Classic gets a 6 out of 10 for intermediate flex and good versatility all over the mountain. The Full Tilt's lightweight materials allow for playfulness over moguls and in the park, but these boots can snap into turns when necessary (it’s right in line with Full Tilt’s freeride slant). With a $400 price tag, the buckles and liner aren’t as high end as some of the models above, but the Classic performs well and is a good value. And we love the simplicity: there just aren’t a lot of moving parts with this boot but it checks all the boxes. What we like: Flexible, comfortable, and cheap. What we don’t: Aggressive skiers or those looking to maximize performance will be sorely disappointed. Not everyone requires a rigid boot that’s been designed to extract every last ounce of performance. Some folks just want to head to the slopes and cruise down their favorite blue run time and again, hence the aptly named Nordica Cruise 60. With a roomy 104mm last and super forgiving flex, it’s about as comfortable as any skiing experience out there. This combination of flex and cush is a great way to get a reluctant beginner into the sport. We don’t recommend the Cruise 60, however, for anyone that loves carving down the hill. Even beginners that are planning to spend a lot of time on the mountain may want to upgrade to a boot like the Rossignol Alltrack 90 so they don’t outgrow its limited capabilities. But at $200, the Cruise is an affordable and comfy way to get started. A great place to start your boot search is choosing the proper flex. 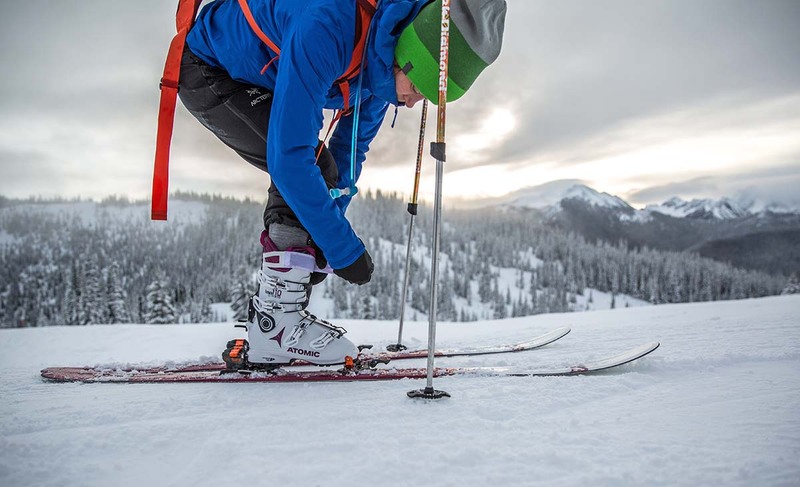 Nearly every downhill boot on the market (the Full Tilt Classic is one exception) is given a flex index number ranging from approximately 60 to 140. Lower numbers are softer, have more give, and are more comfortable, making them ideal for beginner skiers. We cover a couple of our favorite entry-level models on this list, but for a complete look at the best options, check out our ski boots for beginners article. Moving up in stiffness to intermediate and advanced models gets you a boot that isn't as cushy but more efficiently transfers your inputs to the bindings and skis. Less energy is wasted in flexing the boot forward and the response is instantaneous. A preferred stiffness also correlates with your body weight, which is why women’s boots have a lower flex rating relative to performance. Below are general recommendations; there are ranges within ranges but this paints a good picture. Both men’s and women’s ski boots are listed in unisex Mondo (or Mondopoint) sizing: the length of your foot measured in centimeters. You can measure your foot by tracing its outline on a piece of paper or marking the bottom of the heel and top of the toes. If your foot measures 30 centimeters in length, your Mondo size is 30. Getting measured in a ski shop is preferred, but this is a rough way to do it at home. Every manufacturer or retailer provides a sizing chart that matches shoe sizes to ski boot sizes, but your actual Mondo size may be a size or two smaller than what you see on the chart. This is because tight fit is recommended with ski boots. Ski boot liners are made of foam and will mold to your feet over time, so it’s best to start with a very snug fit and wear them in. Footbed width, referred to as last, is another important specification for ski boots. This measurement is based on the width of the forefoot and listed in millimeters. Most manufacturers make ski boots with varying lasts to accommodate those with narrow, average, and wide feet. And some models, including the Lange RX 120, are made with multiple last options. It’s important to get this part of the fit right because side-to-side motion is a given when descending a hill, and a boot that’s too loose around the sides of your feet will negatively affect performance. For those with narrow feet or looking for performance boots with a more precise fit, look in the 97-98mm range. Average lasts are around 100-102 mm wide for men and 100mm wide for women. Those work well for most skiers with normal width feet. For folks with wide feet, there can be some challenges in finding the right pair. 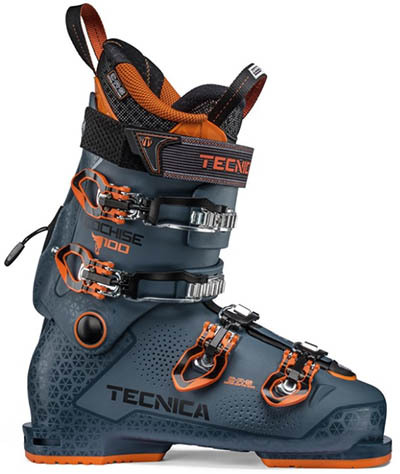 But there are a growing number of boots made in 103mm or wider lasts, including the new Tecnica Mach1 HV. No matter how well you do in selecting the proper fit, you still may experience discomfort during a full day of skiing. That’s where the final piece of the fit puzzle comes in: replaceable insoles. Most downhill ski boot liners have a removable insole, much like a hiking boot. Swapping these out for a quality aftermarket insole that better matches your foot profile can really make a difference. New insoles can provide better arch support, more or less volume, and a heel cup that better locks your feet in place. Good aftermarket insoles can be found from brands like Superfeet and SOLE. Another alternative is getting a custom footbed from a boot fitter (which requires getting fit in-person). This is an expensive process but can be worthwhile for those with stubbornly shaped feet or who ski a ton each year. You can call your local ski shop and ask if they make custom footbeds. Most all-mountain ski boots are made up of two independent pieces: a hard plastic outer shell that provides structure and strength and a removable liner that delivers comfort, support and insulation. The liner is filled with varying amounts of foam, depending on the type of skiing the boot is intended for. It’s not always the best idea to get the most plush and cushiest liner (beginners and comfort-oriented skiers are an exception). The softer foam will not hold your foot and shin as well while carving, and it may not mold as well to your feet over time. Supportive but comfortable is the preferred place to be for most intermediate and advanced skiers. As we mention above, your liner will conform to your feet, so don’t be too concerned if it feels snug at first (but make sure it’s not overly restricting or that your toes aren't smooshed against the hard-sided shell.). 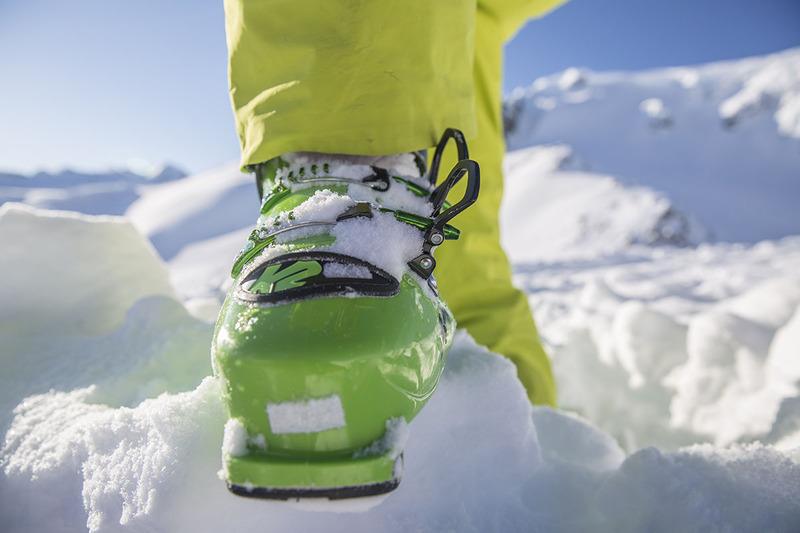 Heat-moldable liners can be custom fit to your feet in a ski shop that has the necessary equipment (styles and equipment can vary between boot brands). This is a nice way to get the liner to fit your feet right out of the box, but isn’t mandatory for many folks. You can get much of the same fitting accomplished just by wearing the liners around the house or in a few early season ski days. That being said, it's a useful tool that helps dial in comfort quickly and effectively. To start, it’s helpful to know that buckles and strap designs do not vary dramatically between brands. The buckle systems on most downhill ski boots follow a similar methodology: two buckles across the foot, one at the bend near the ankle and another along the shin. Look for buckles made mostly with aluminum for greater durability (plastic is cheaper but a bit more prone to breaking). Some boots try and cut some weight by removing the buckle at the ankle, but for downhill purposes when total boot weight isn’t as important, we find it well worth having the more supportive four aluminum buckle design. The strap at the top of the boot near the cuff is another important piece of the design. Sometimes referred to as the power strap, it keeps that top portion nicely locked into place to help bring out the full performance potential of your boots—and at a lower weight and more comfort than adding a 5th buckle. Having a full compliment of buckles as well as a quality power strap also helps in really dialing in the fit, which can make accommodating varying sizes of legs and calves that much easier. Boot soles are pretty standard fare for alpine setups. They need to be what’s called DIN-rated, which essentially means they are able to release properly from a downhill binding should you taken an unfortunate tumble. They also share a common shape that fits any downhill binding, listed as ISO 5355. 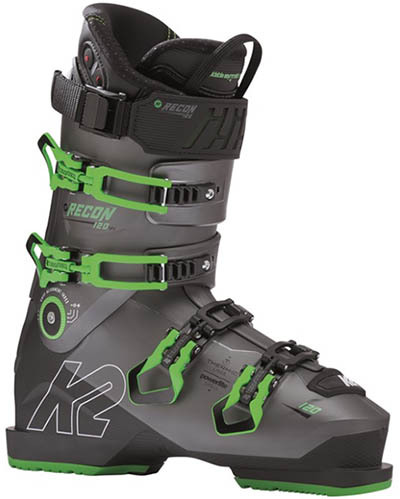 Resort-only skiers should avoid boots that have a rockered sole and are listed as being compatible with AT (touring) bindings. These are for backcountry setups and will not work with many standard downhill bindings. In your search, you inevitably will run into some alpine boots that have been set up to accommodate both AT and downhill bindings, including the impressive Atomic Hawx Ultra XTD above. If you’re interested in getting in to skiing both and trying to save some money, you can get a boot with a removable/replaceable sole, such as the Rossignol Alltrack. But keep in mind that this boot is not optimized for uphill travel. It’s heavy and doesn’t pivot as naturally while walking. Multi-purpose gear can be fun, but it’s often worth the extra dough to get a second boot or premium model like the Atomic or Lange XT Free that have been specifically designed for backcountry use. Until recently, the weight of a downhill ski boot was largely ignored (it’s often not even listed as a spec on many retailer websites). But with the dramatic growth in backcountry and sidecountry skiing—and an increased spotlight on weight in general in the outdoor gear world—we’re starting to see the same lightweight focus trickle down to the resort market. For 2018-2019, the K2 Recon and Atomic Hawx Prime are a couple of prime examples of designs that weigh nearly a pound less than their predecessors (in the case of the Atomic, from approximately 4 pounds 12 ounces to 3 pounds 14 ounces). The benefits of lighter footwear for uphill travel and bootpacking are obvious: you have less weight to move with each step. But even for those riding the chairlift, it helps make it easier to control your skis in tight spaces like bumps and trees. The big question mark is how much trimming weight will impact long-term durability. In the past, lighter boots have required more maintenance and occasionally have had issues with the liners packing out too quickly. But if the latest batch of backcountry boots are an indication, the new downhill models hopefully will have long lifespans. Walk/Hike Mode: Gimmicky or Worthwhile? You’ll see a number of downhill boots that tout a walk or hike mode. In reality, these modes are best enjoyed in the trek from the car to the resort, as they don’t have the necessary range of motion and flex to be truly comfortable when walking long distances. 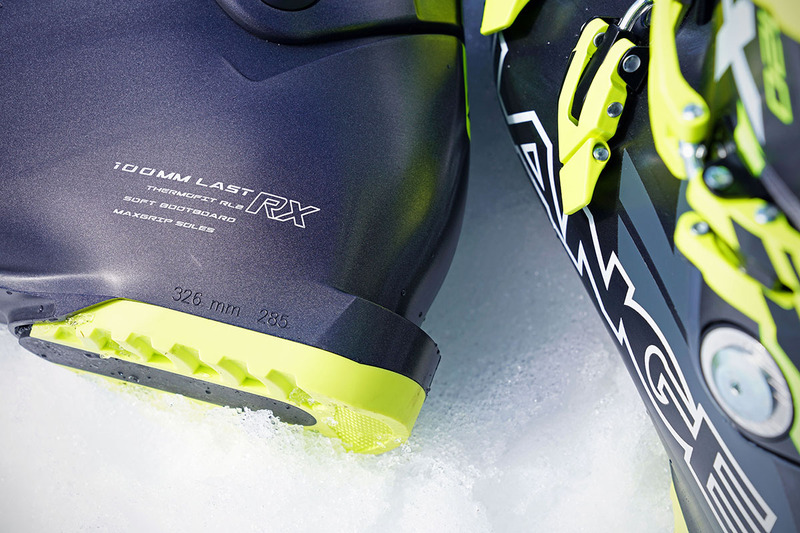 In addition, downhill-focused boots are heavier than dedicated backcountry and randonee boots. It's not all bad news, and the walk feature has its appeals for folks that primarily ski downhill but want the option to do some light skinning or hiking. Just steer clear if you need to spend any more than a few minutes heading uphill. Exceptions to this rule include crossover backcountry/resort boot designs like the Atomic Hawx Ultra XTD and Lange XT Free. It’s no secret that backcountry skiing is on the rise, and many downhillers are adding an alpine touring set-up to their quiver. To help make things easier, there are a growing number of crossover pieces that perform well on both resort days and while touring. In the boot world, options include the Atomic Hawx Ultra XTD 130 and Lange XT Free 130. Both have sturdy 130-flex ratings to fly down groomers, but are light enough and feature a tour mode with good range of motion for backcountry trips. However, if you plan to use them primarily at the resort, there are some compromises to be aware of. The lightweight construction is noticeably less precise when carving on hardpack, and the flex isn’t as smooth as a boot like the downhill-only Lange RX. But they’re still a pretty good option for those looking to purchase only one pair of boots. Modern ski socks reflect the improvements made in boot liner technology. You no longer need a thick, heavy-duty sock, and the market is now full of trimmed-down options. Modern boots are better insulators and far more comfortable, which all adds up to a more enjoyable experience. The best socks are either merino wool or synthetic, and if you can swing the added expense, the wool option is our preferred type for stink prevention and temperature regulation. For a full list of options, see our article on the best ski socks. Boots are a great place to start in assembling your ski kit. For one, it hopefully means you get the pair that end up fitting you best. It also should help guide the rest of your buying considerations. If you choose an advanced boot, you should pick out a correspondingly aggressive binding and ski that can help deliver the performance the boot is capable of. 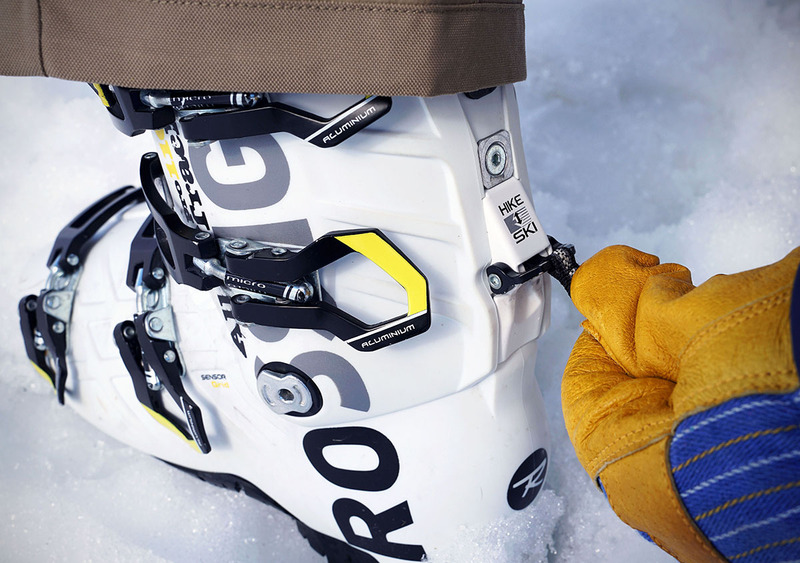 A stiff boot transfers power very efficiently as long as the binding and ski are capable of responding to those inputs. To help get you properly outfitted, our picks for the best all-mountain skis and ski bindings are organized in a similar fashion as boots, broken down by ability level and terrain.